Theresa May made a breakthrough with Brexit negotiations on November 14, when the draft agreement drawn up between EU and UK negotiators was accepted by her cabinet. 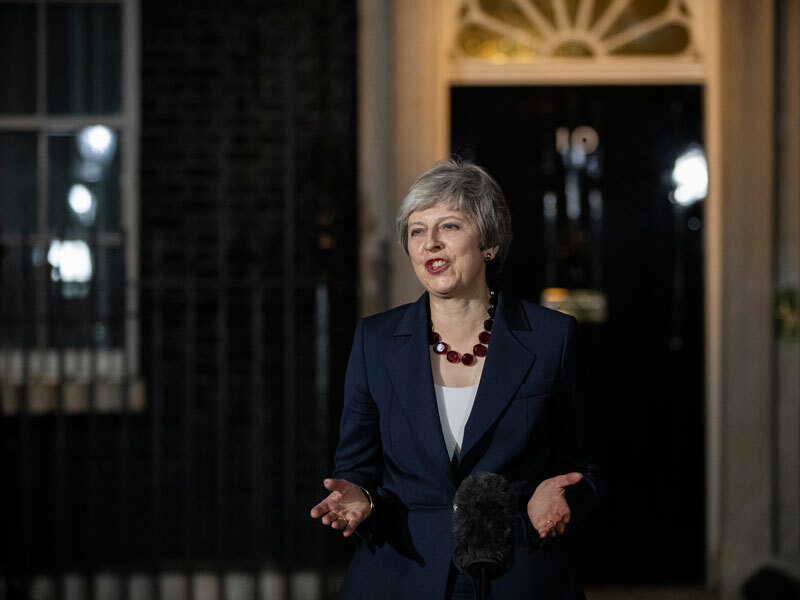 After a five-hour discussion inside 10 Downing Street, May informed the British media that the “collective decision of cabinet” was that the government should press on with the draft withdrawal agreement. In a short statement, she said that the deal “delivers on the vote of the referendum, brings back control of our money, laws and borders, ends free movement, [and] protects jobs, security and our union.” May also defended the deal as being “in the best interests of our entire United Kingdom”. In a late-night press conference in Brussels, EU Chief Negotiator Michel Barnier described the agreement as “a decisive and crucial step in concluding these negotiations”. The UK’s settlement with the EU will outline agreed obligations, the rights of EU citizens in the UK and vice versa, and a mechanism designed to prevent a hard border in Ireland. It also includes a short political declaration outlining the desired future trading relationship, although this aspect of the deal is non-binding and can be renegotiated at any time. Under the terms of the agreement, the UK will be a single customs territory from March 2019 to December 2020, after which point the UK will remain in the EU customs union indefinitely if a new deal has not been struck. Northern Ireland will also remain in the same customs territory as the UK and EU, in a measure referred to as the backstop. EU citizens that have lived in the UK for more than five consecutive years have the right to remain permanently. The deal brings an end to free movement but guarantees visa-free travel to EU countries. The UK will become an “independent coastal state”, but will continue to work with the EU to protect fishing rights. The 585-page deal, which was pored over by cabinet ministers on November 14, will now be examined in detail by both the House of Commons and the House of Lords. Both houses have been highly divided by contentious issues such as the Northern Ireland backstop and the customs union, with some representatives calling for a second referendum and others favouring a harsher deal. As such, it is likely that May will face extreme difficulty pushing the deal through parliament. At the time of publication, the UK Prime Minister had already seen three resignations from her own mutinous party, including Brexit Secretary Dominic Raab and Secretary of State for Work and Pensions Esther McVey. The riven nature of parliament is a source of concern as EU and UK diplomats will have to begin the negotiation process from scratch if the deal is rejected. It must also be individually ratified by each of the EU’s 27 member states and the European Parliament, which has the power to veto the terms. EU delegates will meet again on November 25 in a summit to “finalise and formalise” the deal, according to Donald Tusk, President of the European Council. In business, major UK lobby groups have welcomed news of progress in the negotiations, but have acknowledged that the deal was a compromise and a number of key risks remain. Columnists at Bloomberg, however, have blasted the deal, with Lionel Laurent claiming it gives “absolutely nothing” to the City of London. The agreement proposes an “equivalence” regime, a system that gives firms from non-EU countries access to the EU business bloc, provided they have similar financial regulations. The equivalence policy only applies to certain areas of the financial ecosystem such as securities trading. Retail banking, investment funds, payments and insurance brokers are excluded. In response to the news, the pound fell dramatically, losing one percent against the dollar and the euro in the minutes after Raab’s resignation. The FTSE 100 is down 0.1 percent following McVey’s resignation. These two key market indicators are expected to fall further if further resignations are announced.